Home/Outdoor Living, Uncategorized/Can You Paint POLYWOOD® Outdoor Furniture? The short answer is – ‘yes, yes you can’. POLYWOOD® furniture certainly can be painted, which is great news for anyone who wants to change the aesthetic of their furniture, alter its texture, or to preserve it for as long as possible. However, it is important to approach this painting work in the right way as there are some additional factors you need to take into account when you are painting your POLYWOOD® plastic lumber furniture. In this blog post, we will be exploring this in more detail. But first, let’s get to grips with why you might want to paint your furniture in the first place. 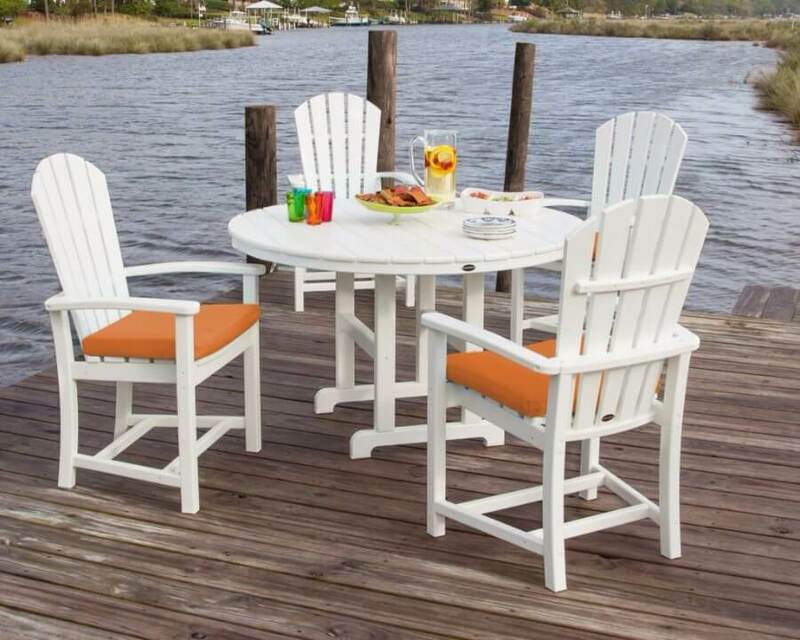 Why Paint Your POLYWOOD® Outdoor Furniture? Buying a piece of POLYWOOD® furniture is an investment in style. Of course, furniture is always a practical addition to any home, supporting the daily lives of all occupants, but this is not all – it also needs to look great. So, when you buy POLYWOOD® outdoor furniture, you choose the style and the finish which best reflect your aesthetic vision. But what happens when this changes? It is natural that this vision is going to shift somewhat over time. It is no surprise then that so many people decide to paint their furniture. But this is not the only factor involved. Living in the coastal area, our outdoor furniture takes quite a battering from the elements. Even the dry, salty atmosphere takes its toll over time, stripping the color from our beloved furniture pieces. After a while, a refresh is required. So, how do we go about the actual task of painting? To begin with, you need to prepare the surface. POLYWOOD® plastic lumber is mainly constituted by HDPE – or High-Density Polyethylene – plastic. In most cases, this has been reclaimed from post-industrial material or from post-consumer plastic bottle waste. The milk, juice, and detergent bottles that you see in the store? These might just end up becoming a POLYWOOD® furniture piece in their next life. This is a durable material but painting it can be tricky. Start by thoroughly cleaning the surface to remove any excess dirt or other contaminants which are going to ruin the finish of your paint job. After this, make sure that the surface is completely dry before painting begins. Next, well, you have two choices for what comes next. Spray paint will work, providing excellent coverage and a reliable finish. However, you must check first that the spray paint you use has been specifically formulated for use with plastic. If you do not want to use spray paint, you may use a water-based primer such as Zinsser 123. This primer is designed to work effectively with vinyl, aluminum, and any galvanized metal – an attribute which lends itself nicely to use with POLYWOOD® lumber. After applying this primer, you will be able to paint directly onto the surface with a brush. This is more time-consuming than simply using spray paint to cover the furniture, but it will give you more control over the finish you can achieve. Remember – DO NOT apply any kind of paint directly onto the POLYWOOD® surface, even exterior paint, as it will simply not adhere. The same applies to a paint and primer combined product – this will simply not work either. POLYWOOD® and other surfaces like it are designed to resist and repel such coverings. Even if you are able to get the paint to adhere to the surface, it will begin to chip and peel in no time at all. So, yes, paint your POLYWOOD® furniture by all means, but be sure to follow the above tips to guarantee success! If you don’t want to deal with paint, there’s a big possibility we have the color of the outdoor furniture your want. Check out our online store!